As the mobile wallet revolution has charged forward, it has largely bypassed one group of people -- those without bank accounts or credit cards. But soon even the "unbanked" will have access to mobile payment technology. At the FinovateFall 2012 conference this week in New York, PreCash announced that it's field-testing FlipMoney, a digital wallet app linked to a prepaid debit card. "Historically, people with the least amount of money and free time pay more and have fewer convenient options to do simple things like pay bills or cash checks," PreCash CEO Steve Taylor said. "Until now, the current cadre of mobile payments and financial services apps largely ignore the needs of people without bank accounts and credit cards." It's a potentially huge market: 20% of U.S. households are underbanked, according to a recently released Federal Deposit Insurance Corporation survey, and 8% have no bank accounts at all. Flip users will be able to deposit checks through their smartphones, getting access to their funds in minutes, rather than the days it usually takes for most remote deposits to clear. 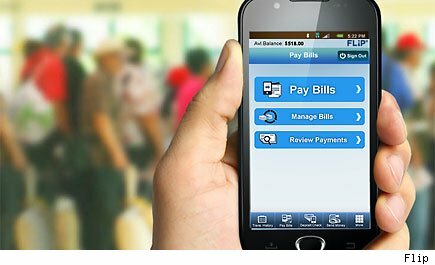 The app also allows for free expedited bill payments to utilities, wireless companies, car loans, and other merchants -- a potential boon for the demographic hardest hit by bill payment fees and late fees. "A person making $30,000 or less a year should be able to pay bills or get paychecks just as easily as someone who makes millions," Taylor said. Of course, there's a cost for the convenience. Prepaid debit cards have a bad rap for charging excessive fees, and Flip is no different. Its fees are comparable: a $3 activation fee, a $5 monthly charge, a $2 ATM charge and a $1.50 bank-to-card transfer fee. Peer-to-peer transfers are free. Actually, it should come as no surprise that someone has finally designed a mobile wallet that caters to Americans without easy access to banks: In the developing world, digital payment has already become a mainstay of the economy. In Kenya, for example, where the majority of the country lacks much of an ATM and banking infrastructure, citizens rely on mobile payment through the service M-Pesa. In a country with 40% unemployment and a per capita GDP of just $1,800, a technology that allows people to move money easily and electronically is of major utility. "[Mobile payment] is fairly democratic," says Nebo Djurdjevic, CEO at Cardis International, an electronic payments software company. "The penetration of smartphones is very high in the emerging and developed markets. Their discretionary spending on luxury goods is limited, but that doesn't meant they're not technologically savvy. Mobile phones are something that are used that is not a barrier, especially in the mobile environments where there is no banking infrastructure." Indeed the same rules apply to the U.S., where 91% of the underbanked have a mobile phone and 57% have a smartphone -- rates that are, perhaps surprisingly, far above those for the overall population, according to the Federal Reserve. With Flipmoney, a U.S. company is finally recognizing that mobile banking is about more than added convenience for the monied, its also about making life easier for those struggling to make ends meet.